Budgeting is all about the future. It’s probably a big part of why you had that I-need-a-budget moment. You had an impulse to make a better tomorrow. Perhaps that vision of a better tomorrow is right around the corner. It might literally be about tomorrow, like paying your electric bill on time, or simply having more money next month to do something special with the kids. Perhaps your vision is to send less money every month to the credit card companies. Maybe it’s a longer play, like buying a home in the next five years, or sending your kids to college fifteen years down the road. The reasons why you need a budget are important. They add meaning to the decisions you make. They act as motivation. They keep you focused. No matter what or when your future aspiration, it is also important how you get there: think long, act now. In dreaming and planning for tomorrow, you’ve already thought long. It’s tempting to throw all your eggs in a future basket, to forecast different scenarios for how to get there. But that isn’t based in reality or in the real money you actually have. It’s only thinking long, and it often ends in frustration. On the other hand, you might try and feverishly pile up money. You’re thinking if you can just get your savings account balance high enough, you’ll have enough for all your hopes and dreams. While this is, unlike forecasting, real money, it isn’t strategically aligned with your day-to-day budget and priorities. It’s only acting now. You need both. But first let’s talk a bit more about how forecasting and saving without a purpose just aren’t it. Just aren’t them. Just aren’t. Why Forecasting Isn’t Thinking Long. There’s a reason that tomorrow’s weather forecast is more accurate than one for ten days later. And why you should never make plans based on those farmer’s almanac forecasts that come out a year in advance. You wouldn’t! But you may have tried to do the exact same thing with your money. To forecast and make plans with money months – and even years – before it arrives. It doesn’t work with weather because there are too many variables. Even over the course of days, there are too many possible combinations of air pressure and precipitation alone to give any certainty about what’s coming next. When you look at a ten-day weather forecast, take it with a grain of salt. When it comes to money, we sometimes think of financial forecasts as absolute certainty. But your everyday life has just as many variables as the weather. How many times have you thought, “If it weren’t for [insert your own unexpected expense], I would finally get ahead”? Pretty much every month, right? When you forecast, you look back at last month’s expenses, or maybe the last few months’. You then make a giant assumption that the next six months will be the same, or even better. You imagine decreasing spending by 10 percent and increasing income by 10 percent and … voila! You’ll have all the money you need. We all like to dream, to play a little bit of what if? Maybe you had a really good month at work and got paid a little bit extra. You want to know what your finances might look like if that happened again three months down the road. Sounds harmless enough, doesn’t it? It. Is. Not. When we forecast, we can always imagine more future money. We can pretend the hurdles between now and then aren’t going to happen. When we forecast, we let ourselves off the hook. When we let ourselves off the hook, we miss countless opportunities to make different decisions right now. Go ahead, imagine countless scenarios. They all have something in common: they take your focus away from today, from this week. From right now. It’s all thinking long without acting now. Gubbins. Or, the Problem with Savings. If forecasting is relying too heavily on thinking long (thinking that borders on pretending), it’s at the other end of the spectrum that we find the second common mistake: just acting now with no connection to a plan for the future. Usually, this involves saving without a purpose. When you save without a purpose, it’s not all bad – you have good intentions and you are saving. No one has ever shown you a better tool (which, by the way, if you haven’t guessed it, is your budget, but that’s getting ahead). So you assume the best way to prepare for the future is simply to save more money. If my account balance were bigger, you reason, everything would be less stressful. More can be helpful. But not always. It isn’t just about having more. The problem, instead, is how we think about the money we’re putting aside – the money you might call savings. The problem with traditional concepts of savings has to do with gubbins. Don’t know what a gubbin is? Neither do we. Actually, they don’t exist. They’re made-up nothings. It’s an abstract metaphor, just to get you to stop thinking about money for a minute. Go with it and we’ll bring you back eventually. Promise. Imagine you have a gubbin, but you don’t need it right now. What do you do with a gubbin that you don’t need right now? You save it. Eventually, you lose track of which gubbins you are saving and how many you want to keep. You start worrying you’re using too many gubbins too quickly. When this happens, you think, I’ve got to separate all these gubbins that I’m saving. I’ve got to get them away from the rest of my gubbins. So you end up stashing gubbins under your bed or burying them in the backyard. Even so, you still pull some out from time to time. After all, you have them. Even though you’re trying to save them, it feels like you don’t have enough. Sound familiar? Or maybe the opposite happens and you never use any of these gubbins you’ve set aside. You never take out any of those gubbins, even at times when you might truly need some, because you feel like you separated them for some reason, even if you can’t identify that reason. You’ve got piles of purposeless gubbins. Whether your piles are getting smaller or bigger, you’ve got no real plan. You know what fixes this problem? Put stickers on ’em. Maybe one says Take on vacation or Give to Mom or For next week’s snack. Maybe you need to give your Mom ten gubbins. So you set some aside until you have a pile of ten. Feels simple. Feels good. Like you have a system. If you really want to, you can think of that pile of gubbins for your Mom as savings. But you don’t have to. You have some gubbins now, but you don’t need them now. So you label them. You can still keep them on the kitchen counter, right out in the open. It turns out that the location of our gubbins doesn’t matter, just their labels. When they’re labeled, you use them for what you intended. When most of us save, we don’t put stickers on our gubbins. We don’t save with a purpose. We were always told that we should save, so we try. But we just furiously set some money aside, thinking if we change its location (hello, half a dozen savings accounts! ), everything will be okay. We’re stuck thinking about the location of our money instead of its job. Your savings dollars aren’t different from your other dollars. They need jobs, too. Explicit, specific, declared jobs, right there in your budget. Once you give those dollars a job, it suddenly doesn’t matter what account they’re in, whether that’s a separate savings account or not. That’s saving with a purpose. So thinking long motivates you, and naming specific jobs for the dollars you don’t need right now adds purpose to your savings. So how do you put it all together? Think long and act now with the power of a goal. Have you ever put it all together and reached a goal? A really important goal? Chances are, that’s what you did. You thought long and acted now. If you head out on a really long (maybe even cross-country) drive, it’s no use forecasting the whole thing down to the minute. You can’t plan to stop for gas two days from now at 7:34 a.m. in a certain town 613 miles along the way. Trying to stick exactly to that is only going to distract you from what’s important – your end destination. Heading out and mindlessly driving toward that destination with no thought of what might happen in between isn’t going to work either. You’re driving without a plan, and you’ll fall asleep at the wheel. So you think long, but keep it simple: you want to get there in less than five days, and know you can only drive for six hours without a break, and there are a few things you’d like to see along the way. You use your long plan with these ideas about what is important–or possible–to make really good decisions about what is best to do right now. It’s no different with your money. It actually isn’t the biggest decisions that make the biggest difference. It isn’t forecasting an exact path through the next six months of your financial life. It isn’t going to require total deprivation, either. Instead, examine each decision you make through the lens of your goal. Will giving these dollars this job move me closer to my goal? Will making this spending decision right now move me closer to my goal? Using this powerful combination of thinking long and focusing your decision-making in the right now, amazing things happen to your day-to-day prioritization. Suddenly, the decision about whether you should buy a new $20 picture frame to go with the other dozen on your mantle isn’t simply about whether or not you can afford it. That’s beside the point. The real question is, does the picture frame get you closer to the summer vacation you’ve been planning on? No? There’s your answer. When you combine the power of giving every dollar a job with setting a goal, your behavior changes right now. And it’s not even that hard. That’s it. You can do it. Of course, you’ll need to make sure that goal is clear. Your priorities are clearer. They’re meaningful. You’ve realized the fallacy of forecasting. You’re ready to use goals to give meaning to your saving. But what kind of goal should you set? Consider what’s most important. Do you need to have a specific sum of money set aside? Is there a date when you need to have that specific amount? Or maybe you just want to be sure you’re setting some aside each month (yes, even in college, before you have a job, you can think about retirement). Or maybe your goal isn’t about having money add up but instead, paying off a debt. Answers to these questions inform the type of goal you’re going to set. Maybe you’d like to have $1,000 set aside for car repairs, because that’s the most you’d expect to have to spend for a single repair. Or your goal is to replace your living room couch. Eventually. Sometime after the kids completely ruin the one you have now. But not too long after. 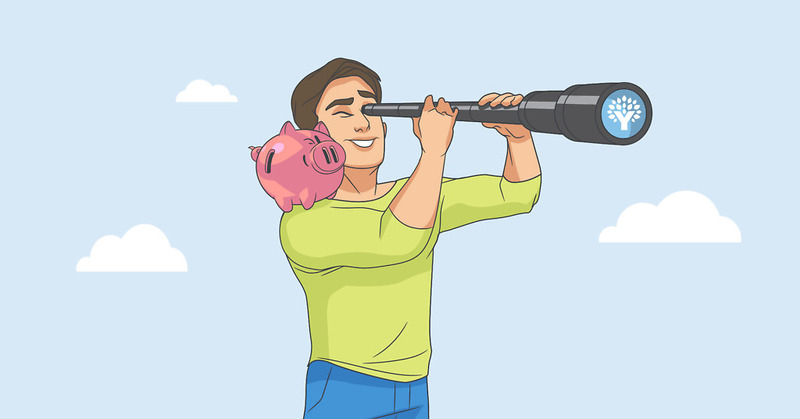 Neither one requires a specific time frame, so you set a goal for the amount, then make this a part of your decision-making each time you budget new money. Perhaps you need $2,000 for a tuition payment by August or $400 for holiday shopping by November. Expecting $350 of that to drop out of thin air the month before isn’t a good plan. Use your goal to help you set aside a certain amount each month until that goal date arrives. Some goals, like saving for retirement, come without a specific time frame or amount. So you take the best guess you can about how much you should save. Even with a guess, though, it’s important to hold yourself accountable. So you set a goal to budget $250 every month. As retirement gets closer, you can always be more specific and identify a concrete time frame or a revised total amount. Maybe your goal has to do with balances going down instead of up – you’re trying to pay off debt. Whether you set a specific time frame or not for this type of goal is up to you. The key is making sure that you are maximizing your payoff amount without jeopardizing other priorities in your budget. Your goals will help hold you accountable as you budget. They also, though, need to be flexible enough to respond to changing needs. For example, if you set a goal to budget $100 towards auto repairs each month, but it restricts your cash flow so much that you can’t meet immediate needs, consider adjusting that goal. If you get those other cash flow issues straightened out, come back to it. It’s a process. Not every goal needs a time frame attached to it. Almost by definition, the ones that do are your highest priorities. If you have a goal with a time frame and you are falling short, you may need to adjust your progress toward other goals in order to make it there. Or ask yourself, which of these two (conflicting) goals is most important? Think long and set your goals. You’ll be amazed at how they change the way you act now. When you set and fund your goals, your money doesn’t go out the door so quickly. A strange thing starts to happen: your balances will grow. If you have worked toward simplifying your finances, this might happen right inside your checking account. Where you see it every time you look at your account. Maybe this is making you uncomfortable. Which is odd, because it is exactly what you wanted. But you might worry that a growing balance means dollars are going to escape your control. Or maybe you’re starting to feel like spending some of them. You’ve got so many of them now that those new jeans will go practically unnoticed, right? But remember, you’ve given those dollars jobs, and they are moving you toward an important goal. You’re not saving without a purpose. Instead, you’re mastering one of the most challenging, yet most rewarding, financial skills: letting money sit. When you don’t give your dollars jobs, it is difficult to let your money sit. There’s no real payoff, other than watching your balance grow. It’s bigger, sure, and that feels like a good thing, but it starts to feel like you should be doing something with all that money. You get itchy. But your money is growing because you have a budget. When you make your spending decisions based on the jobs in that budget, there’s nothing to worry about. Now, with a budget? You see $400 for car repairs, $600 for your vacation. You’re not just going to spend that on another new set of napkins for the dining room table you never use or eating out again. When you let money sit, you’re thinking long and acting now. You’ve had a lot of practice thinking long, daydreaming about possibilities in your life. When you clarify your priorities as a part of your budgeting, you’ll know which of those possibilities is most important to you. But you can’t stop there. That’s just thinking. You also need to act. Right now. By setting a goal, you will hold yourself accountable for the day-to-day behavior that can make future possibilities into tomorrow’s reality. Better yet, you will see progress toward your goals – the summation of many little decisions – and that will only make it easier and easier to make those positive long-term decisions. Suddenly, because you’re giving every dollar a job and setting long-term goals, everyday decisions you used to anguish over suddenly become, well, simple. It’s a virtuous cycle.